Today we board an international flight bound for Chengdu, China. Cross the International Date Line. Arrive in Kunming. Our guide will meet you at the airport and transfer you to the luxury hotel for rest and relaxation. After breakfast, drive to Dali. On the way, you will visit Chuxiong Museum. Dali is a city in the West of Yunan, with historical, scenic and architectural significance. After arrival, you will tour the old town of Dali and the pagodas at the Congsheng Temple, the Temple was constructed during the Tang Dynasty and is one of China's finest example of the skill and architectural genius of the ancient craftsmen. This evening you will have a special dinner featuring a clay pot fish. After dinner, we will stroll along the famous street "Yangrejie". After breakfast, we journey by bus to Lijiang, the cultural center of the Naxi Minority. Lijiang has beautiful landscapes and has been designated by the UN as a World Cultural Heritage Site. Gaze in wonder at the sights and sounds of this ancient city as you walk down the cobblestone streets preserved for over 700 years. We see that the Naxi way of life has changed very little over time. Upon arrival, we tour the old town of Lijiang including Black Dragon Pond. Enjoy the famous local cuisine "Wang's Family Banquet" for dinner. 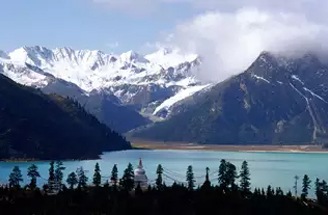 A whole day excursion exploring the fantasy of Lijiang, including tour Spruce Meadow of Jade Dragon Snow Mountains. The bus drops us off at the base where we take a cable car to the higher regions that afford a beautiful view. We will enjoy the fantastic outdoor production called "Impression Lijiang", the show is directed by Chinese famous director Zhang Yimou. In the afternoon, on the way return to the city, we visit the Baisha Village, the ancient capital of the Naxi Kingdom. Then we stop at the Shuhe Old Town for visit. After breakfast, you will tour Mt. Jizu (ascend and descend the mountain by cable). The view from the top is spectacular. Drive back to Dali in the afternoon. After breakfast, we drive back to Kunming. In the afternoon, tour Daguan Pavilion and West Hill Park. Tonight, we enjoy Yunnan Wild Mushroom hot pot for dinner. After breakfast, we take an excursion to the remarkable Jiuxiang. Known primarily for its limestone caves, it also boasts an underground waterfall and an awesome gorge. Travel to Stone Forest in the afternoon. 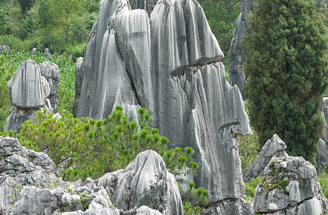 After breakfast, we drive to Lunan, tour the Stone Forest, it bristles 75 miles southeast of Kunming. The ashen stone pillars, abandoned by the sea as it receded hundreds of millions of years ago, bunch together into a geological ticket. The journey to the forest is as beautiful as the landscape that surround it. Drive to Xingyi, capital of Qianxinan Miao Prefecture and the hometown of General He Yingqing. You will tour Maling River Scenic Area. After breakfast, we drive to Huangguoshu, tour the famous Huangguoshu Waterfall, it is the largest water fall in China. After breakfast, you will tour the Dragon's Palace scenic area. Drive to Guiyang, capital of Guizhou Province. You will tour Jiaxiu Pavilion and enjoy sour fish soup dinner.